Queens Quay Architects International Inc.
Aptly named Urban Eatery, the relocated food court is the ultimate urban dining experience within a classic modernist setting. The food court reflects urbanism, multi-culturalism and the city of Toronto. Urbanism is reflected through the uber-cool contemporary design cues, multi-culturalism through its ethnic food diversity, and the city of Toronto through the presence of some of the city’s local casual restos. The varied seating layouts support a dynamic customer experience. Four freestanding island locations were created to promote a more interactive traffic flow, avoiding a typical “run of retailers”. 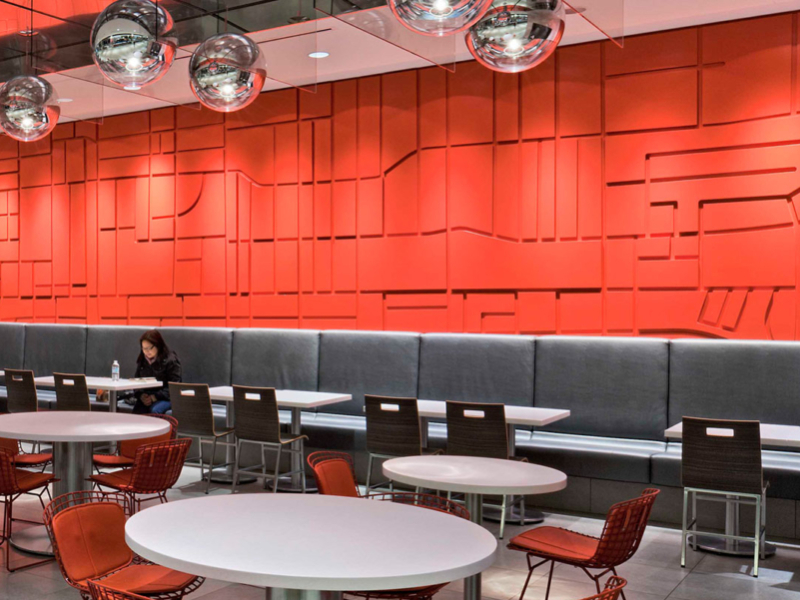 The red relief wall mural at the entrance rotunda and in the seating area is the city grid of Toronto.